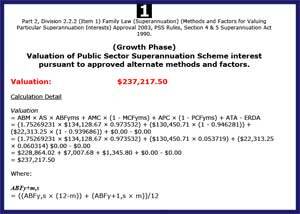 We have been providing family law superannuation valuations using our specialist software since 2003. We efficiently provide valuations for 'normal' funds as well as funds with approvals for special methods/factors such as the ones listed below. Please note that we have a new website here. We have invested in superior technology to provide much better value than our competitors whilst providing very high quality. Essentially we can devote almost all our time to the accuracy of the report itself, almost no time is needed for the calculation, word processing, delivery, accounting and administration. This is a huge cost saving for us that we can pass on to you. See the transparent comparison of the main providers below. All reports have full commentary - not an extra charge. We will contact the Trustee if in our experience something seems odd about their information. We always send you a non-disclosable draft report before committing to an official one. You can track processing and ETA, and download both draft and final reports, from within your own account web page. Can easily be checked (i.e. nothing is hidden). Make your client feel they are getting good value for their money. Look very convincing to the other stakeholders which leads to less conflict and expense and affidavits (because the figures are internally proven v. a bare result which needs the author to promise that the figures are correct). The reports are instructive and easy to follow - for example many reports even cross-reference to the exact page number of the current reprint of relevant legislation. We provide a predictable uniform service in terms of work-flow, report formats, correspondence, turnaround, price, invoicing etc. We have been involved in valuations from the very early days of the superannuation legislation, and have detected and instigated amendments for various errors in the legislation. Therefore we have experience as well as a vigilant attention to detail. We provide reliably quick turnaround and flexible payment options (see below). Our technical advantages combined with years of litigation experience enable us to provide a high quality report for less cost than competitors. Trevor Lewis is an experienced private-sector litigation lawyer, so you will find it easy to talk to him at your level. We optionally provide an express posted spiral-bound colour-printed hardcopy as well as the standard speedy pdf version. For completeness, the hardcopy appends all source documents, and the pdf version appends scanned copies of all source documents. We provide telephone numbers for Qld, Nsw, Vic - to save on the cost of any call to us. The reports include a web-link for checking whether a report has been withdrawn. This has never been required in practice, but gives a mechanism for withdrawing a report if ever needed. You can use us to benchmark your existing supplier's performance. The following sample reports show the format and high level of attention and detail that we provide. Solicitors need to contact us for a quote or we can provide a link that can be used to self-serve costs. Specially-approved funds that we handle in addition to normal ones. To make life as easy as possible for you and your clients we offer a wide range of payment options, and a substantial discount for paying 'up-front' by MC Visa or direct deposit. We don't impose a surcharge for credit card payments. Although most of our clients are solicitors we do also accept direct briefs from the public. Turnaround is within one week of final instructions, or if needed, faster by arrangement. All other things being equal, we process valuations in order of payment. We are ready to accept your instructions now. Complete the standard Form 6 (or equivalent for special funds - see links below) and submit it to the relevant fund. Specify the relevant date(s) carefully. Contacts and links to forms (eg the Commonwealth's SmartForm) for common funds are provided below. We recommend that you obtain a benefit (pay-out) estimate at the same time. We will check your instructions for completeness and email you confirmation plus a tax invoice. If you have asked for a quote, or the fee differs from the prices shown or previously advised then we will await your instructions to proceed, otherwise we will proceed automatically. We will calculate the valuation and prepare a draft report. We will email you when the draft report is ready to download from your account area. Automatically after a specified time, or upon your instructions, we will then produce the final signed report and make it available for download. It will append all the source documents as part of the report. If you opted for a bound colour printed spiral-bound hard copy then we will send that to you by Express Post.